Despite the national stereotype that Kentucky is a diehard basketball state, at the high school level the state produces many times over more top nationally ranked football players than basketball. In the past ten years the state has produced many players ranked among the top 20 in their position, notably Tim Couch, Chris Redman, Dennis Johnson, Eric Shelton, Michael Bush, Brian Brohm, Mario Urrutia, Earl Heyman, André Woodson, Micah Johnson, and DeVante Parker. An increasingly growing number of top baseball talent is also coming from Kentucky, such as Brandon Webb, Austin Kearns, and Paul Byrd. Louisville has had practically a monopoly on the state's top players since their recent success on the national stage. The football Cardinals have historically depended on the states of Florida and Georgia for a majority of their talent, and currently over 65% of the team's starters are from those two states. As of 2012, there were six high school rugby teams in Kentucky. Despite a recent surge in the quality of the University of Louisville football team, and all UofL sports during the "year of the cardinal" or "Louisville slam", college basketball remains the sport of choice in most of Kentucky. Western Kentucky University's men's basketball program is one of the ten most winning in the history of the NCAA, and has one Final Four appearance (1971). Murray State University is a perennial threat to win the Ohio Valley Conference and appear in the NCAA Tournament, having done so 13 times. However, the question in Kentucky college athletics is most often "Red or Blue?" referring to the primary colors of its two flagship universities – the University of Kentucky (blue) and the University of Louisville (red). In recent years, the Louisville Cardinals have further proven themselves, not only as one of the state's best organized college athletic programs, but elite on the national stage. The University of Louisville Cardinals are consistently the most profitable college sports franchise in the nation, ranking first in Kentucky with a basketball revenue of $42,434,684 during the 2012 fiscal year. Kentucky came in at 5th on the list making $21,598,681. The Cardinals' program has been deemed to have the most equitable fanbase of any school in the country, according to a study conducted by Emory Sports Marketing Analytics. This is likely due to the fact that almost half of the state of Kentucky's population lives in the city of Louisville and the university has a strong presence citywide. The University of Kentucky is ranked 7th on the list. The rivalry between the North Carolina Tar Heels and the Duke Blue Devils is perhaps the only in-state basketball rivalry that compares on a national scale to the rivalry between the Kentucky Wildcats and Louisville Cardinals. A 2006 Lexington Herald-Leader article stated that interest in UofL sports is surging across the state of Kentucky, especially in Hopkinsville and Owensboro. An October 21, 2006 Louisville Courier-Journal article also stated that the total sales of UofL merchandise has tripled since 2001 and that the school now ranks 32nd nationally in sales, up from 41st in 2001. UofL ranks 2nd in the Big East Conference and the 3rd highest among all urban universities (to Southern California and Miami) in merchandise sales. UK's merchandise sales have steadily remained around 14th in the nation, by far the best in the state. UofL now has more registered collegiate license plates than the University of Kentucky (18,300 to 17,000); a fourfold increase since 2004. In 1995 UK had a 15,000 plate lead on UofL. It is also important to note that in the last few years the Louisville Cardinals have been the most profitable college sports franchise in the nation and have been deemed to have the most equitable fanbase of any school in the country according to a few studies. Fuel was added to the fire of this rivalry when Rick Pitino, the UK coach who led the Wildcats to their 1996 National Title before leaving to become coach of the NBA's Boston Celtics, returned to the Bluegrass State to coach the Cardinals in 2001. Many in the state compared the move to the treachery of Benedict Arnold. The situation was exacerbated by the transfer of underachieving Wildcat power forward/center Marvin Stone. Stone's best season with the Cats was his sophomore season, when the former McDonald's All-American averaged 6.0 points and 4.6 rebounds per game. Under Pitino, however, Stone averaged 10.7 points and 7.3 rebounds for the Cards, including a 16-point, 7-rebound, 2-block performance against the Wildcats in an 81–63 Louisville win on December 28. The modern series, which began in 1983, was started with a win by the Louisville Cardinals. However, in recent years the Kentucky Wildcats have dominated the series, winning 5 of the last 7 meetings. At least three college coaching legends have been associated with programs in the state of Kentucky: Adolph Rupp (UK), Denny Crum (UofL), and Rick Pitino (both UK and UofL). Also, several successful NBA players played in the state, including Pat Riley, Wes Unseld, and Dan Issel. Only the UCLA Bruins have won more NCAA championships than the Kentucky Wildcats, with the Wildcats ranking first in almost every other significant measure of a successful program. In addition to UK and UofL, the Western Kentucky Hilltoppers are also a historically successful basketball program. In 2011, the University of Pikeville won the NAIA Men's Basketball National Championship, followed only days later by Bellarmine University, who won the 2011 NCAA Men's Basketball Division II National Championship in Springfield, Massachusetts. Both teams began their 2011-2012 seasons ranked #1 in the nation in their respective leagues. The impressive history of college basketball in Kentucky has been punctuated by a few notable eras of dominance by the two flagship schools. Under Adolph Rupp, the Kentucky Wildcats were the most dominant team in the early history of the NCAA Tournament. From 1942 to 1958 the Wildcats won four NCAA titles (1948, 1949, 1951, 1958). They also won the 1942 National Invitation Tournament. The Louisville Cardinals were dubbed "The Team of the 1980s", winning two national titles during that decade (1980 and 1986). (Only the Indiana Hoosiers equaled this number during the 1980s.) Under coach Denny Crum, UofL was the only team to go to four Final Fours during the decade, and had more wins than any other team over that span. Darrell Griffith won the John Wooden Award in 1980 and in 1986 "Never Nervous" Pervis Ellison became the first freshman to ever be named NCAA Final Four MVP, a feat equaled only by Syracuse's Carmelo Anthony. The Kentucky Wildcats were the most dominant team of the 1990s, winning two national titles (1996 and 1998), with three straight trips to the NCAA Championship game and four total trips to the Final Four. UK's 1996 National Championship team is considered to be the best NCAA team of all time, as evidenced by the nine players on the roster who played in the NBA. UofL has recently dominated the football rivalry, winning 70% of the games in the Modern Series which began in 1994. UK leads the all-time series, 10–8. For all their success in basketball, the Kentucky Wildcats have been unable to remain consistently competitive in football. The last two Kentucky football seasons have resulted in an embarrassing 2-10 record. Playing in the brutally competitive Southeastern Conference, the Wildcats won an SEC title in 1950 under legendary coach Paul "Bear" Bryant and shared SEC titles in 1976 and 1977 under Fran Curci. Bryant left the school in 1953; some attribute the move to a conclusion that the football program's popularity would always remain a distant second to the basketball program, at that time coached by Adolph Rupp, a legend in his own right. UofL hired legendary coach Howard Schnellenberger in 1984. The team has continued to rise under coaches John L. Smith, Bobby Petrino, and Charlie Strong. On November 2, 2006, the 5th-ranked UofL football team defeated the 3rd-ranked West Virginia Mountaineers in what was dubbed "The Dream Game", the second time in Big East history that two top-5 teams had ever met. The game was ranked as the most-viewed ESPN Thursday night football game ever. The game marked a new high in a program that had been on the rise for several years. Only one week later the Cardinals were defeated by a third undefeated Big East team, the upstart and 15th-ranked Rutgers Scarlet Knights, in what was billed as the biggest college football game in the New York City Metro Area in 60 years; with the Empire State Building even being lit with the Rutgers team colors. The game was also one of the highest rated ESPN Thursday Night games ever as a record crowd in Piscataway, New Jersey stormed the field in celebration. The loss ended the Cardinals' national title hopes, but the team did receive a bid to the FedEx Orange Bowl. On January 2 the Cardinals defeated Wake Forest 24–13 in the Orange Bowl to claim the team's first BCS Bowl win. More recently, the state has been at the forefront of coaching integration in Division I FBS football. Following the 2009 season, all three of the state's FBS programs filled their coaching vacancies with African Americans. The first to do so was Western Kentucky, who hired Willie Taggart to replace the fired David Elson. Louisville followed suit by hiring Charlie Strong to replace the fired Steve Kragthorpe. Finally, Joker Phillips, who had been the designated successor to Rich Brooks at Kentucky, took over after the latter announced his retirement. The first African American head coach at any of the Division I football programs in Kentucky was Ron Cooper, who coached at Louisville between 1995 and 1997. The Division I Football Championship Subdivision (FCS) Eastern Kentucky Colonels have held a long tradition of football success. Until the 2009-2010 season, the Colonels were tied with Florida State University for the most consecutive winning seasons (32). In that season, EKU finished 5-6. Eastern returned to the FCS Playoffs in the 2011 season, in which it lost to #17 James Madison 20-17 in the opening round. The Colonels have won 20 Ohio Valley Conference (OVC) titles and two FCS (formerly I-AA) National Championships, in 1979 and 1982. Much of Eastern Kentucky's success came during the long tenure of head coach Roy Kidd, who led the team from 1964 through 2002. The program has continued its success under more recent coaches Danny Hope and Dean Hood. Professional football, baseball and basketball all at one time had teams in Kentucky. The National Football League and National League had early franchises in Louisville, and the Kentucky Colonels were a mainstay of the American Basketball Association that joined the National Basketball Association with the ABA-NBA merger in 1976; the Colonels were one of only two ABA teams that were kept out of the merger (the other was the Spirits of St. Louis). In 2004, the New ABA added a Louisville-based team called the Kentucky Colonels, which was replaced by a team in Murray, Kentucky in 2007. That team was originally also named the Kentucky Colonels, but the name was changed to the Kentucky Retros in March 2007 in deference to the tradition of the Louisville-based teams. The team eventually announced that they would relocate to Louisville. Pikeville, Kentucky will also become home to pro basketball in the 2007–2008 season, with the East Kentucky Miners joining the Continental Basketball Association. In minor league baseball, the Louisville Bats of the International League are the AAA affiliate of the Cincinnati Reds. The state has two Class A teams—the Lexington Legends are a member of the South Atlantic League and affiliated with the Kansas City Royals, and the Bowling Green Hot Rods, an affiliate of the Tampa Bay Rays, moved from the SAL to the Midwest League in 2010. In the independent minor leagues, the Florence Freedom are a member of the Frontier League's eastern division, playing their home games at Champion Window Field. In soccer, Louisville is home to two minor league teams. Louisville City FC began play in the United Soccer League in 2015. They were the reserve team for Orlando City SC in that season, but the affiliation ended when Orlando City announced plans to field a team-operated reserve side, Orlando City B, in the USL starting in 2016. The Derby City Rovers (originally known as the River City Rovers) have played in the semi-professional Premier Development League since 2011. ^ Another future NBA player, Scott Padgett, was attending UK at the time, but was academically ineligible for the 1995–96 season. ^ "American Basketball Association team looks to bring new energy to Murray". The Murray State News. January 19, 2007. Archived from the original on March 15, 2007. Retrieved February 14, 2007. ^ "Kentucky team announces name change". American Basketball Association. March 14, 2007. Archived from the original on September 30, 2007. Retrieved March 16, 2007. 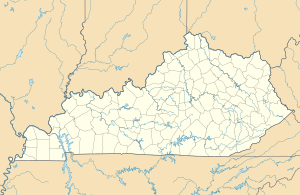 Wikimedia Commons has media related to Sports in Kentucky. This page was last edited on 27 February 2019, at 05:11 (UTC).